Heat 2 tablespoons of oil in a large skillet set over medium heat. Once hot, add the onion and cook for a couple minutes, until it starts to wilt. Add the garlic and cook for another minute, until fragrant. Incorporate the tomatoes, tomatillos and sprinkle in the salt, sugar, allspice, and cinnamon. Mix well and cook for another 5 minutes, stirring occasionally, until the vegetables have softened. Incorporate the almonds and olives and continue cooking for another 7 to 8 minutes. Turn off the heat. Season fish with salt to taste. Heat the remaining 2 tablespoons of oil in a large casserole set over medium-high heat. Once hot, add the fish skin side down and cook for one to two minutes, until the skin begins to brown. Scrape the chunky sauce over the fish, cover the casserole and reduce heat to low. Cook for 10 minutes. I like to serve it over rice or steamed potatoes. I made this tonight for the first time. I followed the recipe exactly, except I used Mahi Mahi, because my grocery store didn’t have halibut. I was afraid that my husband wouldn’t like it, but he LOVED it! We’re trying to eat fish 4 to 5 days a week, so I’m always on the lookout for something new and different. This was definitely different and absolutely delicious. The warm allspice added such a unique flavor profile! This recipe is a keeper. Thank you, Pati! I’m so happy that it is a keeper, Judie! I’ve created a wonderful dessert that I would love to share with you so you can give your personal spin on the ingredients and make it special. I have been using your recipes for a long time and I’ve enjoyed everything of yours that I’ve made. I’ve even gone from my traditional cooking to way more Mexican cooking that I didn’t think I could do You make it look so easy and it is with your instructions. If you would like to have it please reply to my personal email and I’ll be happy to share. I made this using Maui and it came out great. Thanks!! Can I use regular Cinnamon for this recipe? I finally made this dish last night with cod. Easy and very delicious. Thanks Pati.. I love your show! Oh that sounds like a great dinner, Kelly! I’m so happy to hear that you find the recipes fun and attainable! Kelly, what kind of chicken did you use–boneless breast, bone-in breast, or drumsticks? And how did you cook it and for how long? Omgosh!! I never cook fish in the house. I bbq it. But this is a game changer. It was easy to make. And it was the BOMB!!! Looks great! What kind of rice would you serve this with? Any really! I have served it both with white rice and green rice and it works just as well. You can find both here on my site. Your food looks so delicious. I just love to watch your shows on create. I am learning new things with you. Thanks a bunch. It looks amazing and can’t wait to have a dinner party for my friends. 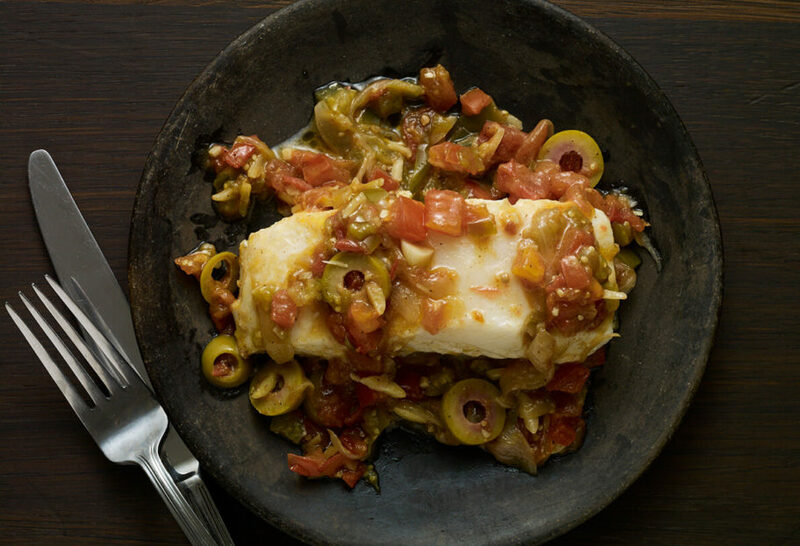 Halibut is one of the best, even if you don’t like fish. You might be surprised.